If you’re looking for a healthy snack to replace potato chips and crisps, then kale chips might just become your new best friend. They are light, crispy, and relatively inexpensive and easy to make. I’ve made a lot of kale chips with just a little oil and salt, and that’s it. Now, that’s all good and fine, but if you really want to take your taste-buds for a joyride, then grab a lime and some coconut and mix it alllll up! Earlier this summer my aunt gave me a beautiful box of coconut lime kale chips she had picked up from her local farmers market. As soon as I tasted them, I was in love. They had that amazing sour and salty combination that you find in salt and vinegar potato chips. The sort of flavor that literally makes you salivate and cause that involuntary jaw twinge. I just had to recreate them at home. I find the tangy, coconutty, crispy, chewy sensation brought on by these chips completely addictive. I think you will too. Wash and Dry Your Kale. Dry it very, very well. Mix In The Oil and Spices. Get in there with your hands. Bake Until Nice and Crispy. Proceed to eat them all in 5 minutes. Preheat your oven to 300 degrees F and line a baking sheet with parchment paper or lightly grease with coconut oil. 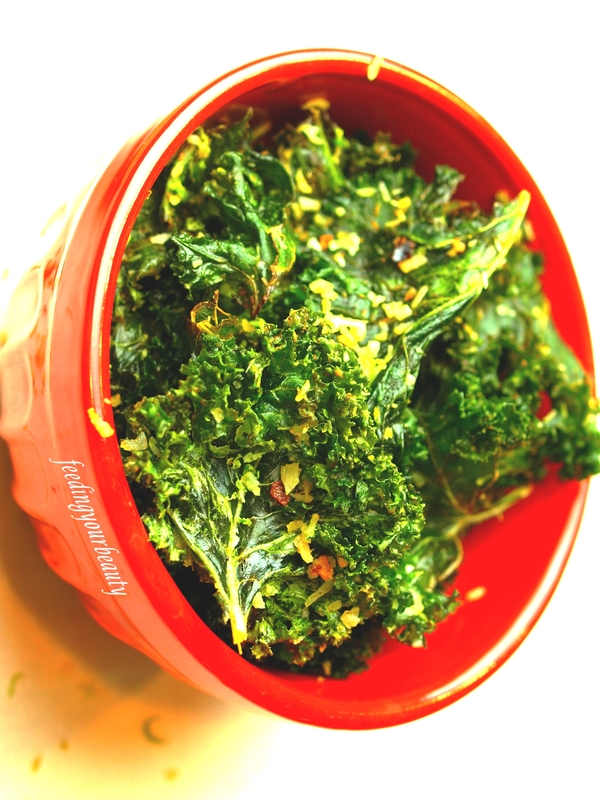 Dry your kale very well. Tear chip-sized pieces from the stems and place into a large bowl. Pour in the oil and lime juice and massage into the kale, aiming to coat each piece. Sprinkle in half of the lime zest, coconut, nutritional yeast, salt, and Thai seasoning and use your hands to mix everything in. Layer the kale on the prepared baking sheet and bake in preheated oven for about 10-12 minutes, turn baking sheet 180 degrees, and bake another 5-7 minutes, checking to make sure the chips aren’t burning. Take chips out of the oven and let cool for a few minutes, they’ll crisp up a bit more. *You can wait and sprinkle the lime juice on the chips after baking, for extra crisp chips. The lime juice will make them crisp on the outside with a chewy center. Both ways are good. **The main ingredients of the thai seasoning are the lemon peel and chilis. You can sub in a sprinkle of dried lemon peel and chili powder (or cayenne for more spice/kick). Or substitute your favorite spice or seasoning. What is your favorite salty snack? 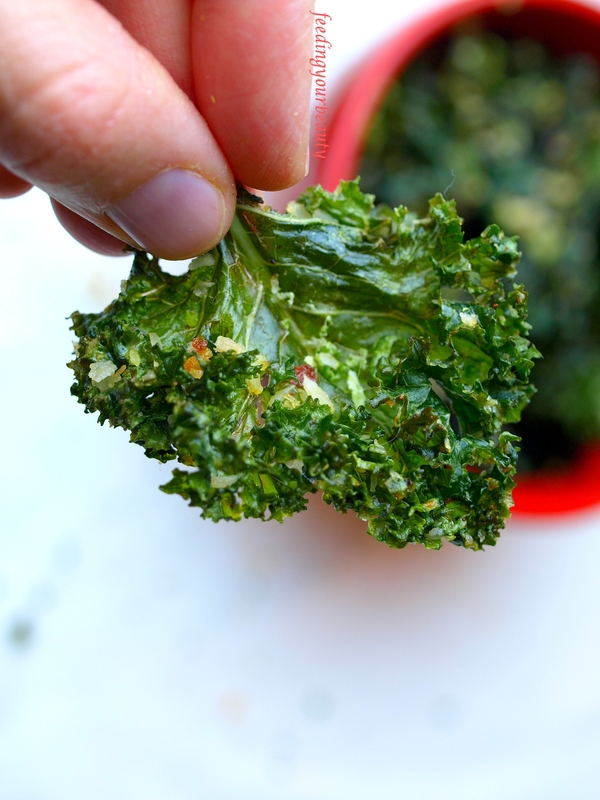 Have you ever tried making your own kale chips? Lol!! I wish I had two ovens! I love kale chips!!! I will have to try this flavor combo! Aren’t they too good?! Before I started working on this recipe I hadn’t made them in a while. I have definitely started something now 😛 Let me know if you give this flavor a try! I make kale chips quite a bit, but I have never flavoures with Thai spices, sounds yummy.